Understanding the different business models used within the software industry can help you select the best solution for your business.� The models vary from ?high volume / low cost? to ?high cost / low volume? and come with a number of pros and cons that means making the right decision is critical, especially within a small business environment. You?ll hear numerous terms bandied around that include ?shrink-wrapped?, ?off-the-shelf?, ?vertical market? and ?bespoke? amongst others.� Many of these are based upon legacy models set-up before internet usage became the norm.� The criteria is fairly simple, the larger your target audience and potential user base the less you are likely to be charged for using the software. Examples include office suites (Microsoft Office and OpenOffice), email clients (Outlook, Thunderbird), accounts systems (Sage and QuickBooks) and Content Management Systems (Joomla and Mambo).� Some of these are aimed at a specific target audience like small businesses or home users. A good example for businesses, of this kind of approach, is a company like Sage " the developers of the popular business accounts software. They have used a reseller model to reach their target audience.� Sage focused on accountants, offering them incentives to sell their products and services.� Interestingly though, Sage makes a significant percentage of their revenue from technical support and upgrades.� This is understandable (to some degree) because every budget requires them to make alterations to their business accounts and PAYE solutions. Examples include custom built solutions " based upon frameworks like Joomla, SugarCRM and other open source foundations " as well as bespoke solutions that are developed for specific clients. Historically, software houses would develop a solution for a client and then market it to a wider audience, normally within the ?vertical market? within a specific sector.� I worked for a business in London that developed systems for the Mechanical & Electrical industry " initially for a blue chip company " that went on to sell the system to the Facilities Management and Construction Industry.� During this period " the mid ninety?s " the market was significantly easier to break into, but with the introduction of the internet through the latter part of the decade users were able to access a wider selection, often at significantly less cost.� This model started to collapse towards the end of the decade with the increased use of outsourcing to BRIC (Brazil, Russia, India & China) block. The wider adaptive nature to the internet has had a massive impact on software developers, enabling them to reduce the cost of distribution and technical support.�� Back in the nineties we used to have a release date that had to account for sending the installation disc to a specialist company that would produce the floppy disc / compact disc along with any packaging / printed documentation.�� As a developer we used to have to fight to stop the sales team trying to push through late amendments as bugs in a final release candidates were extremely costly (and embarrassing).� These days software houses simple release an upgrade and many automate this procedure to ensure users are using the most up to date version of their solution. A number of new models have emerged since the tail end of the nineties and more recently the wide accessibility to broadband (since around 2002 / 03) has enabled the industry to recreate itself with Software as a Service (SaaS).� This isn?t a new model by any means, it was widely anticipated to take the business world by storm around ten years ago, but fears around security prevented early adapters moving away from secure networks. If we applied the ?Pareto principle? " more commonly referred to as the 80 / 20 rule " you would notice that the ?high volume / low cost? model makes around 20% of their revenue from licenses and 80% from maintenance agreements , where as the opposite is true of the ?low volume / high cost? models. 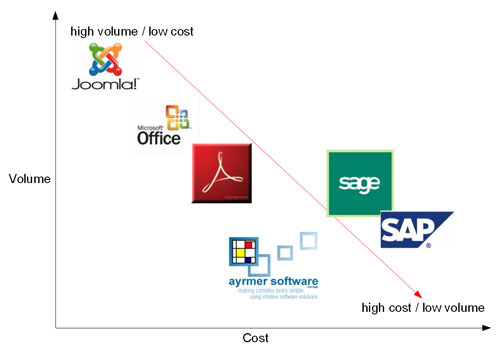 When considering any software solution you need to consider the ?total cost of ownership? (see understanding the total cost of ownership) that takes into account� the ongoing costs.�� Take for instance the ongoing costs of opting for Microsoft Office; you?ll need to take into account upgrade costs.� Since 1995 we have seen a number of versions that include� ?95, ?97, 2000, XP, 2003, 2007 and now 2010.� At an average cost of � 300 that would have cost you around � 2,100 to keep up to date with the latest versions.